A not so simple garden: Pelargonium "Burgundy"
The pelargonium hybrid to the right/bottom (pic taken at Plant Delights) often is mistakenly called P. sidoides in horticulture, but in fact is a hybrid between P. reniforme and sidoides. I consider P. reniforme and sidoides similar enough to be grouped into a single, variable taxon encompassing a variety of plant and foliage forms and flower colors. When I was engaged in doctoral research at Cornell, I made several crosses between sidoides and reniforme, and the resulting hybrids were also fertile. Other people, such as Michael Vassar, have also made similar hybrids, although I do not know who made "Burgundy". I am growing at least 4 different forms of P. reniforme, and have grown a couple of others in the past. These forms have stems arising from a tuberous root network, green to grey green small (one inch) to large (3 inches) foliage, and magenta or pink flowers. The most spectacular and distinct form I grow is a form collected and given to me by Fiona Powrie (shown on the left/top), formerly of the National Botanical Garden at Kirstenbosch in South Africa. 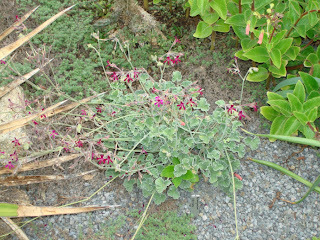 It has huge thick tomentose leaves, very short stems, and well branched sprays of pink flowers. I observed numerous healthy plants of it growing on the "African Hill" at the botanic garden at UC Berkeley last August, to which I had brought it several years earlier. It also sets the least seed of all forms I have grown, and may merit separate species rank. Another form given to me by the late Joan deVilliers of Johannesburg, SA is the best grower, flowering well when set out in the garden during the summer. 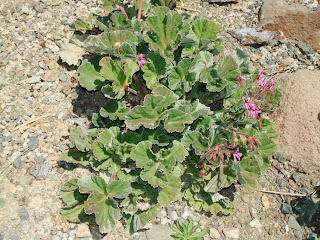 It is more typical of what is considered reniforme, having green foliage and magenta flowers. Another form from Logee's, and thus probably from England, has small tomentose leaves and pink flowers on a plant with elongated stems. I also grow P. sidoides, including plants originally from wild collected seed from near Plutosvale in South Africa. Variation appears to be less than what I have seen in P. reniforme, as all forms I have grown have silverish foliage and very deep burgundy, nearly black, flowers, much darker than "Burgundy". Stems are very short, and flowers are fragrant at certain times of the day, a rare feature among pelargoniums. Robin Parer has seen P. sidoides in the wild, and told me that it did show much more variation in nature. I suspect that wherever P. reniforme and sidoides overlap in nature they would create hybrid swarms that might explain some of this variation, or, another interpretation could be that they are merely forms of the same taxon. Any form of either species (or their hybrids) are easy growing plants which merit a place in a pot or in a sunny garden for the summer. Both species have survived mild winters outside with mulch for protection in the Bronx when I worked at the NYBG, but plants will do better if lifted and brought indoors for winter. Cuttings root easily and tuberous roots can be divided to produce more plants. Lifestyle Seeds-More Great South African Seeds! Silverhill Seeds-Great South African Seeds! I'm a high school biology teacher with a passionate interest in plants for as long as I can remember. I have two horticulture degrees, BS and Ph.D. from Cornell and I've worked at the New York Botanical Garden in the past. My plant interests are quite simple: everything! Still, I have a special affection for South African plants, including, of course, pelargoniums (aka "geraniums").